Sharp Lines Old Times: Warm enamel meets cold silver. A few weeks ago while googling for something completely different I stumbled across a very interesting picture shown below. 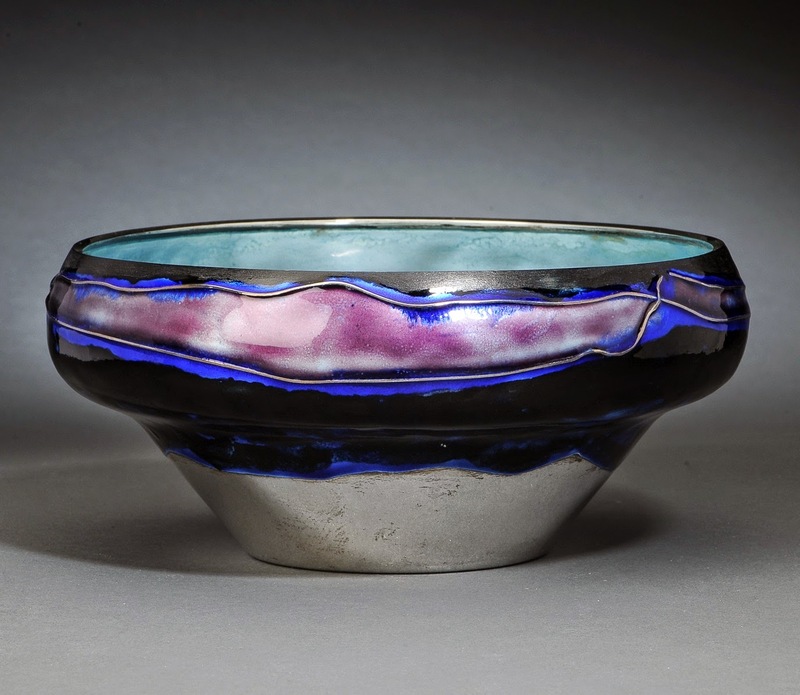 It showed a larger silver bowl with a beautiful but unusual layer of enamel designed by Danish artist Inger Hanmann. 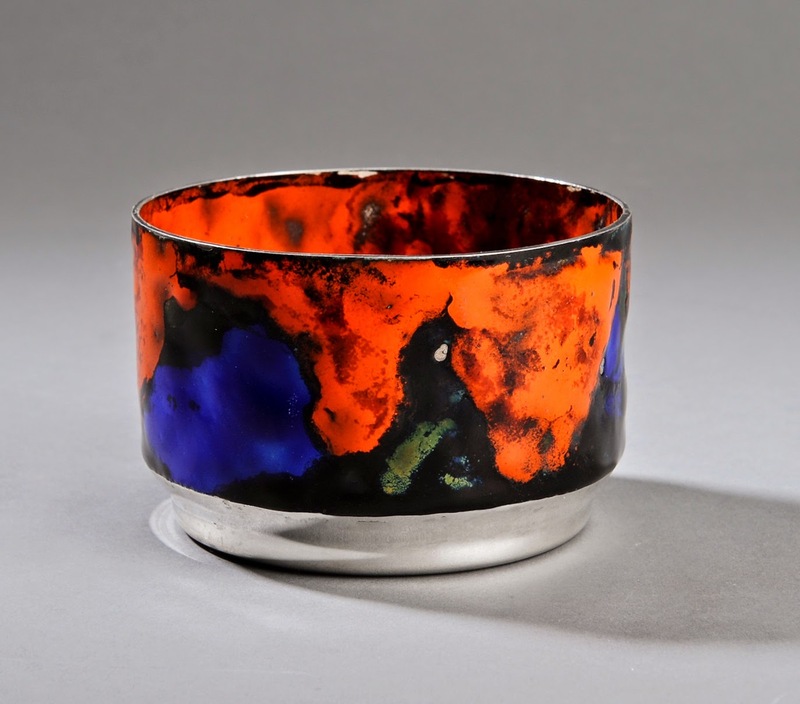 It intrigued me and made me further explore the interesting meetings that can occur when colorful enamel meets cold Danish silver. Inger Hanmann was born in 1918 and grew up in a veterinarian’s home in Stege, Denmark. Her father raised Inger rather untraditionally as a boy teaching her to box and knock over horses. From an early age Inger showed a keen interest in music and drawing so on her father’s recommendation she travelled to Copenhagen to study art at a school for women only. She stayed there in 1935-38 becoming infatuated with modern art, esp. the works of Matisse and Picasso, and enjoying jazz music. In her senior year Inger married a 12 year older lawyer and gave birth to her first child, Marianne, soon after. While spending the following years as a housewife and raising their daughter, Inger longed to once again pursue her interest in the arts. She started studying at Rostrup Bøyesens School of Art in 1946 where Inger met artist Poul Frederik Hanmann. A year later she left her husband and married Poul. They had a daughter, Charlotte, in 1950. Poul and Inger would share their atelier for the next 30 years being a constant inspiration to each other. While struggling to develop their artistic expression in the early years Poul and Inger would both teach in drawing at evening schools in Copenhagen. Inger also illustrated fashion for several Danish magazines. 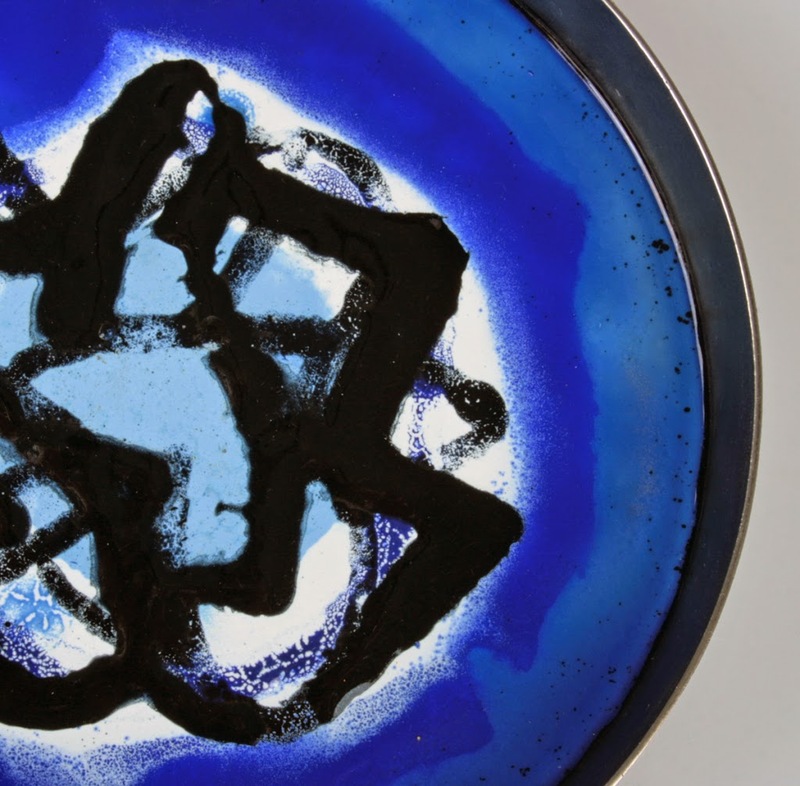 Inger’s breakthrough came when the director, Marius Schou, from C. Schous Fabrikker asked her to try using a artistic approach to the industrial enamel that was a main part of the company’s production. This led to a vast series of experimental work that gained much attention for their striking beauty, bright colors and large sizes. 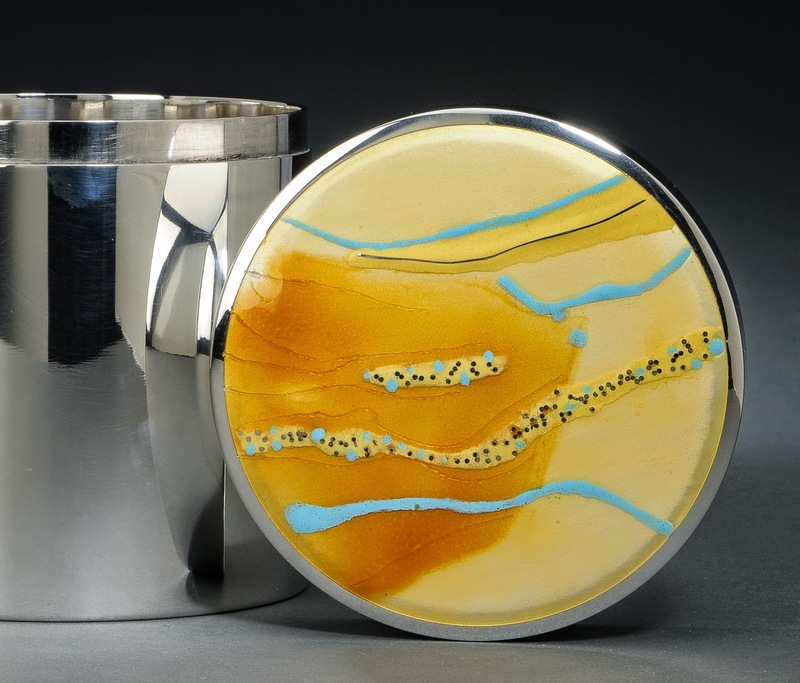 It was not long before renowned Danish silversmith Anton Michelsen hired Inger to apply her artistic experience with enamel to their silver works. Later she would also work for Georg Jensen. Today Inger’s award wining work can also be found in several public institutions around Copenhagen in the shape of especially large wall plaques, notably 100 square meters of enameled decoration in Kastrup Airport (1989). Inger also created a 16 m. high sculpture of enameled cobber plates for the Danish embassy in Berlin (1999). 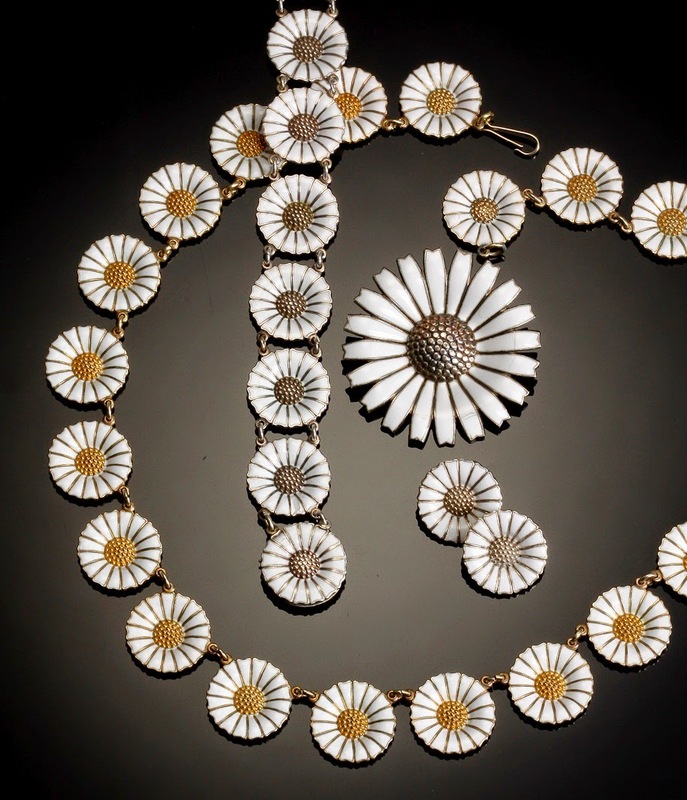 The best known use of enamel among the Danish public must be the Marguerite jewelry line. 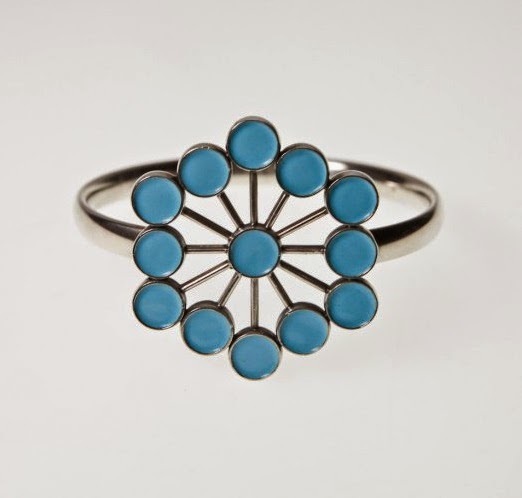 The first marguerite piece was made in the early 1930’s at Juvelér Carlman in Stockholm, Sweden. It was a brooch shaped like a marguerite flower with numerous diamonds placed in platinum. When Crown Princess Ingrid married Crown Prince Frederik on the 24th of May 1935, her father gave Ingrid the brooch as a memory of her mother Crown Princess Margaretha of Sweden. Margaretha’s nickname was Daisy, the more common English word for marguerite. Both her real name and nickname were passed on to the present queen of Denmark, Queen Margrethe. 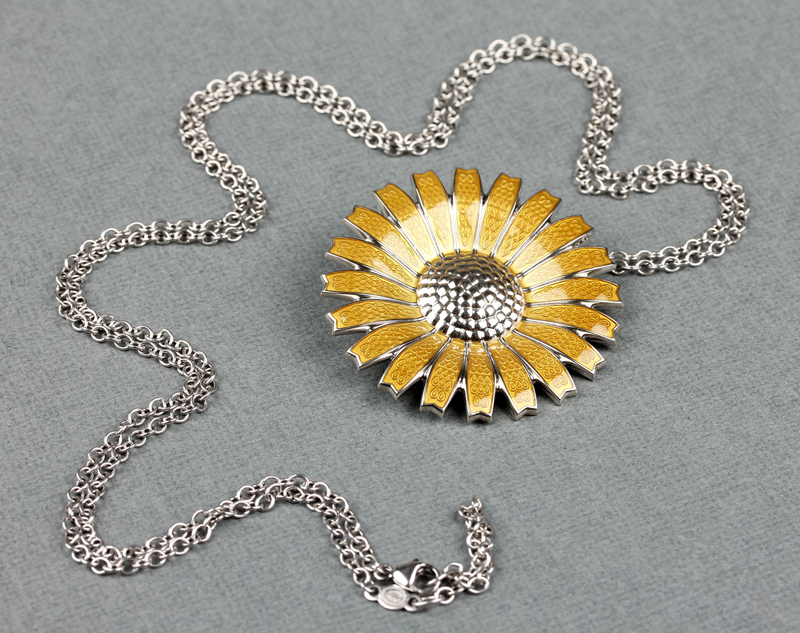 Princess Margrethe was born in 1940 and soon after renowned Danish jewelers like Volmer Bahner, Anton Michelsen, Bernhard Hertz and Jysk Emblemfabrik started making marguerite jewelry. They each had slight differences in the design but were all made of gilded silver and enamel as a much more affordable version of the original marguerite brooch. They were very popular under the German occupation of Denmark in 1940-45 as the marguerite became a symbol of hope represented by the new princess. 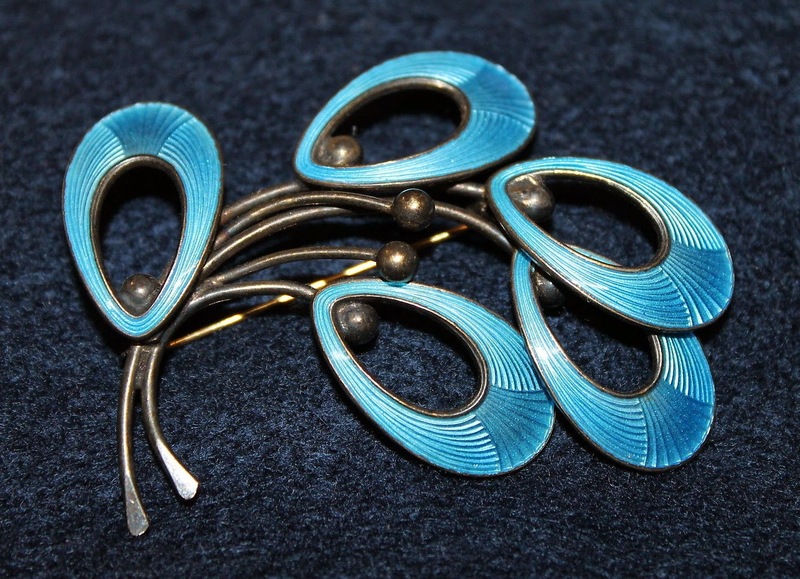 In 1940 silversmith Erik Magnussen designed this brooch and matching earrings entitled ‘The Nordic Swans’. The brooch symbolized unity between Denmark, Sweden, Norway, Finland and Iceland who’s continuous existence was seriously threatened by Nazi Germany. 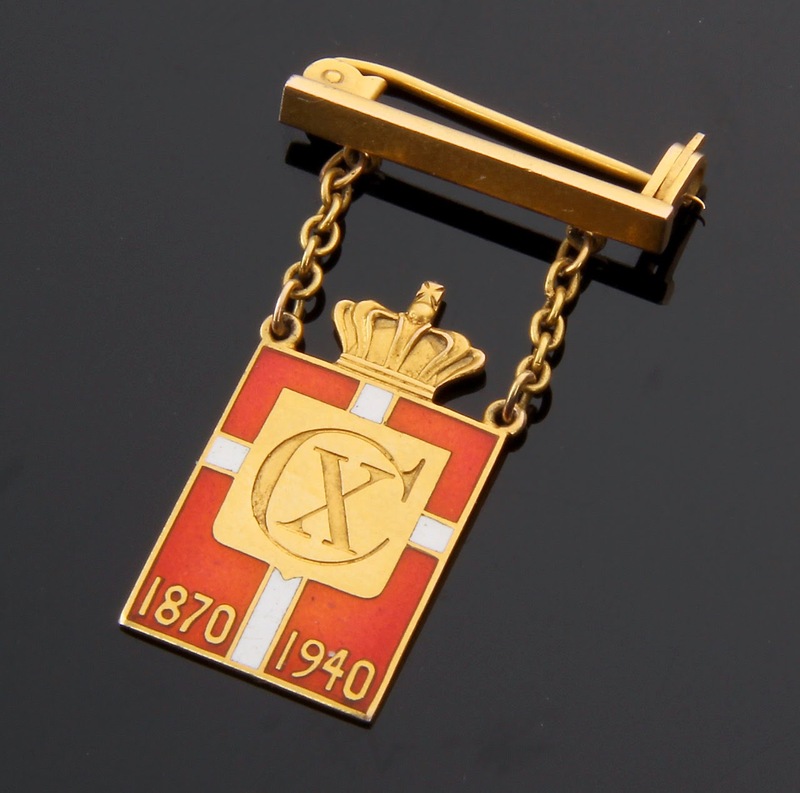 Another enameled symbol worn by numerous Danes in public defiance to the Germans was a small pin made to celebrate the 70th anniversary of King Christian the 10th. While profits from the sale went to a charitable foundation in the King’s name, the pin also became a growing symbol of supporting the royal Danish family. Especially after late 1943 when the royal family became the only remaining Danish institution after the Danish government had resigned in opposition to the deportation of Danish jews and newly formed death sentences to captured Danish resistance fighters. The pin was designed by artist Arno Malinowski and made by Georg Jensen in several enameled versions, both cheap and expensive. Sales became a huge success selling over one million pins from its launch in 1940 up until the King’s death in 1947. Interestingly Georg Jensen had at first been quite reluctant to produce the pin not believing in the overall idea. However the company’s pressing financial situation eventually made Georg Jensen change its mind about participating in the project. The renowned silversmith had been struggling to keep its doors open since the war began. Sales were slow and materials scarce as import of expensive metals like silver and gold was heavily regulated and could often only be acquired by re-melting jewelry and silver cutlery from old stock or bought from the public. 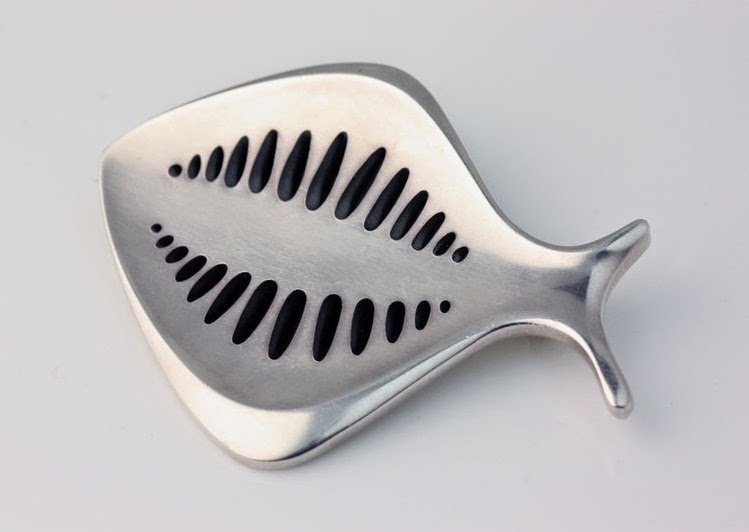 Ironically the continuous production of this little pin saved Georg Jensen from bankruptcy. 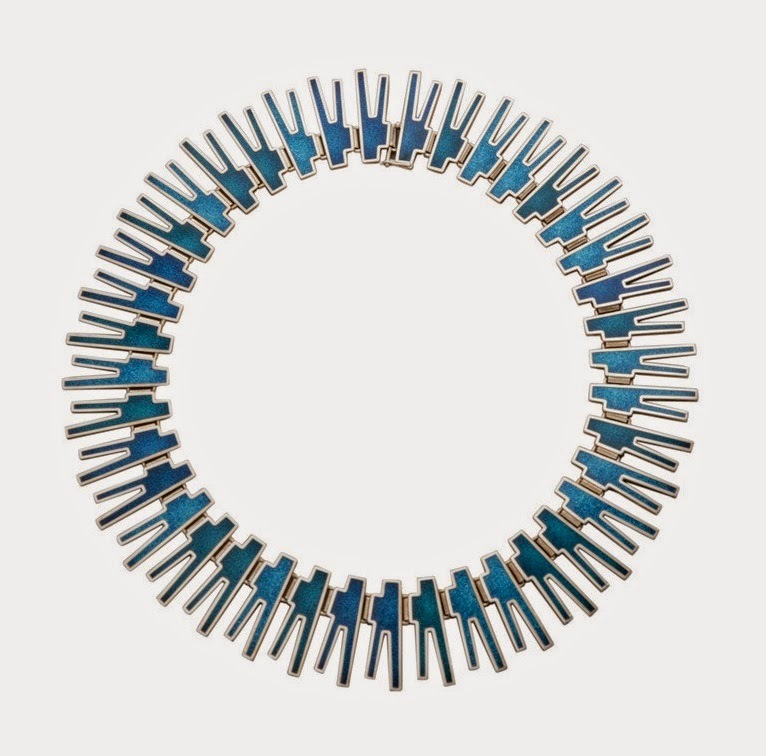 in what was to become a golden age of Danish jewelry. 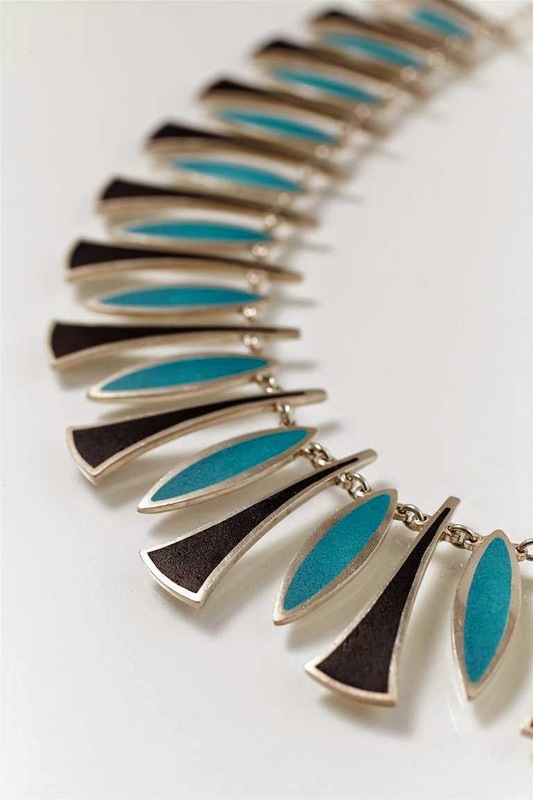 Necklace by Bente Bonne (no. 120). Close-up showing the beautiful abstract shape being repeated continuesly. 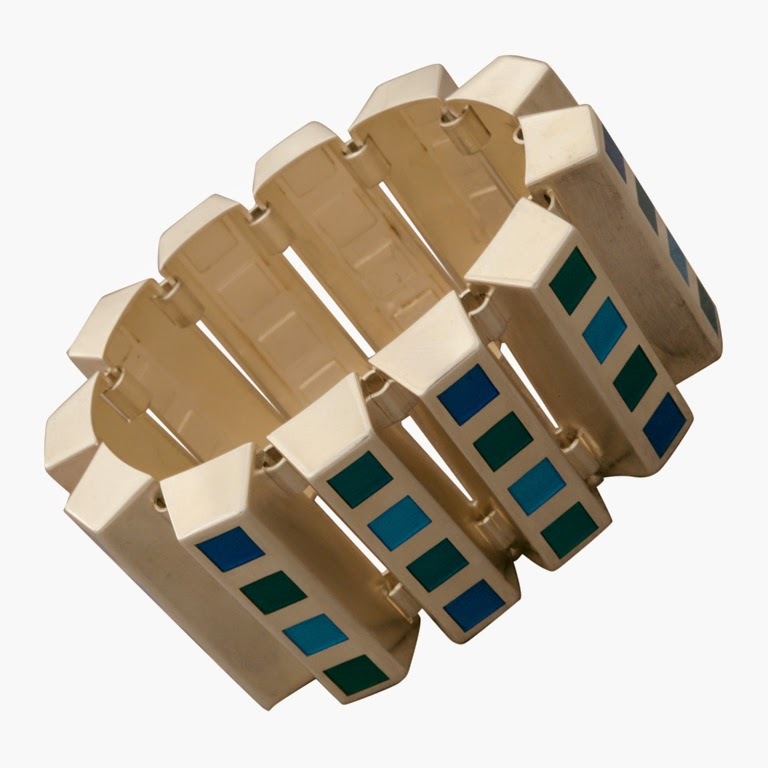 Ring by Astrid Fog (no. 238). 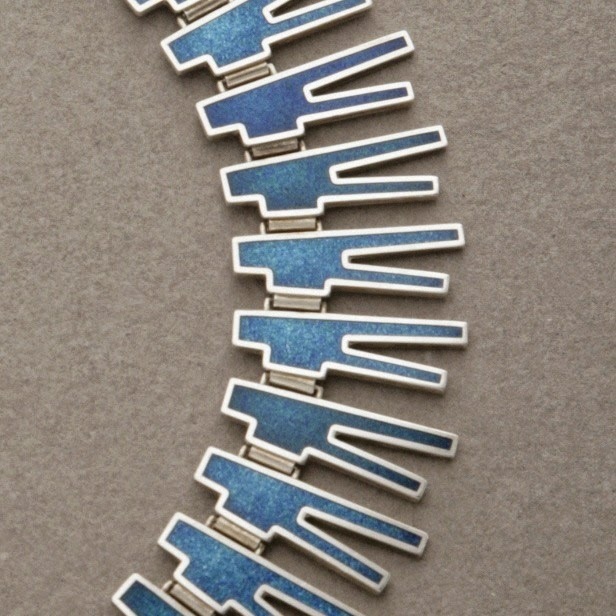 Brooch by Henning Koppel (no. 343). 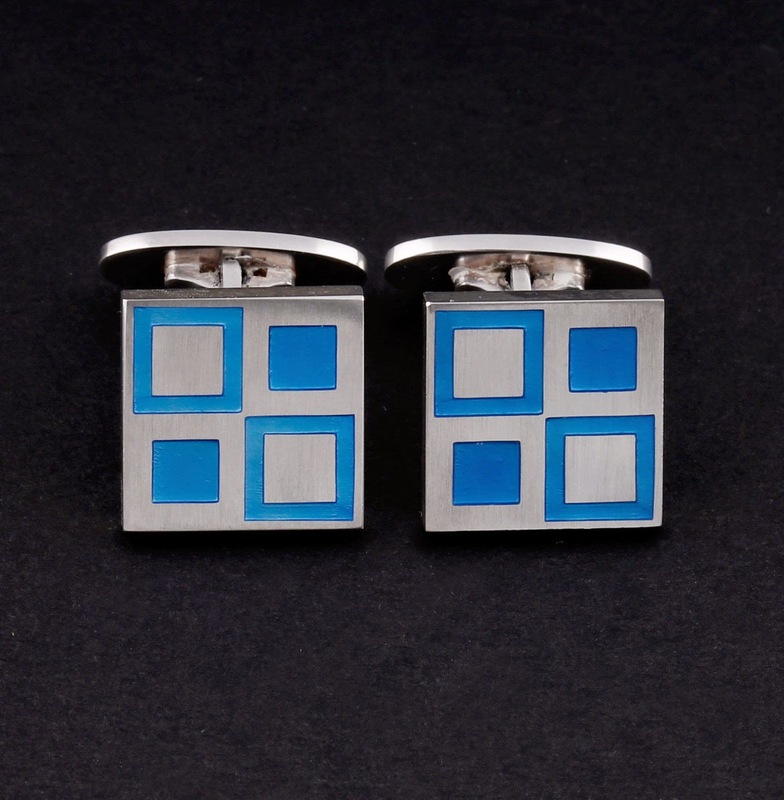 ‘Mosaic’ cufflinks by Magnus Steffensen (no. 87). 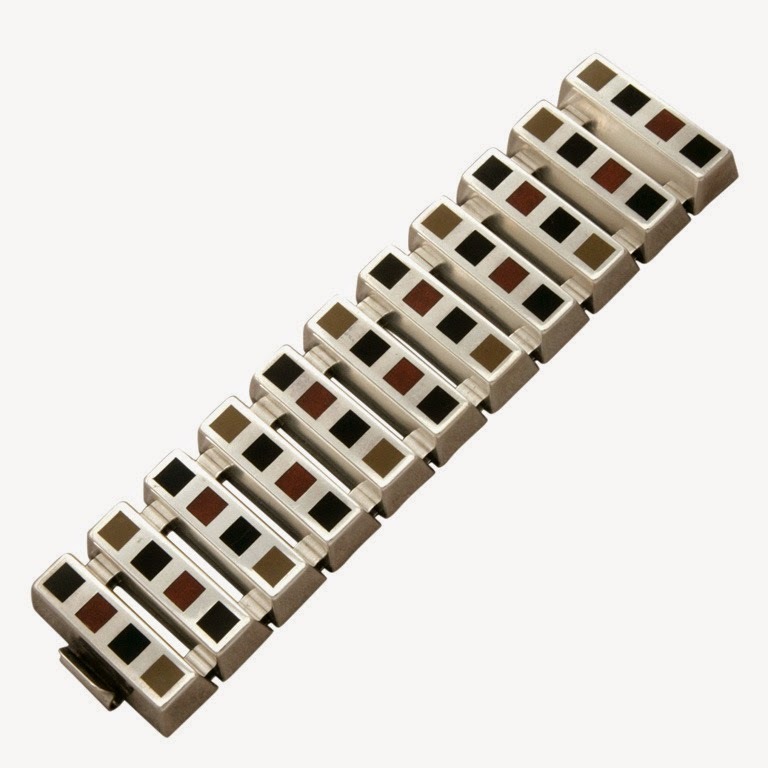 Very heavy bracelet with muted enamel colors by Nanna Ditzel (no. 143). very typical of Nanna Ditzel's preferable color scheme. 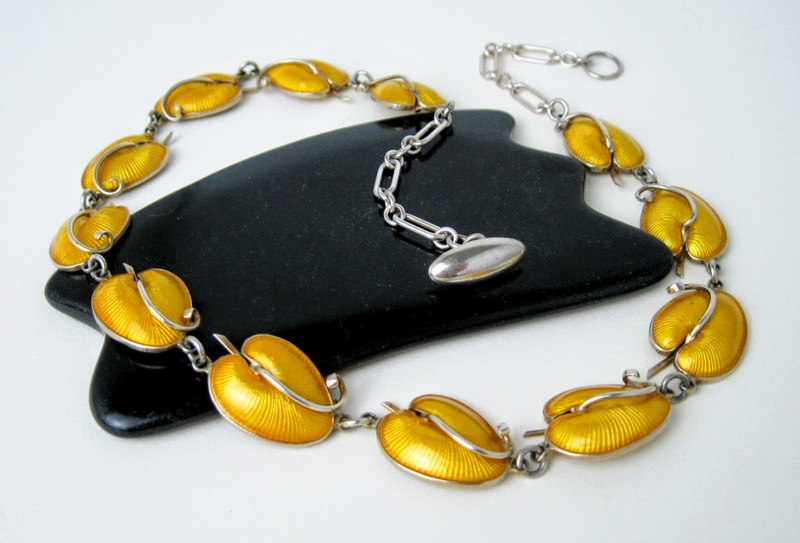 Other Danish silversmiths and jewelry manufacturers also used the enamel and silver combination. 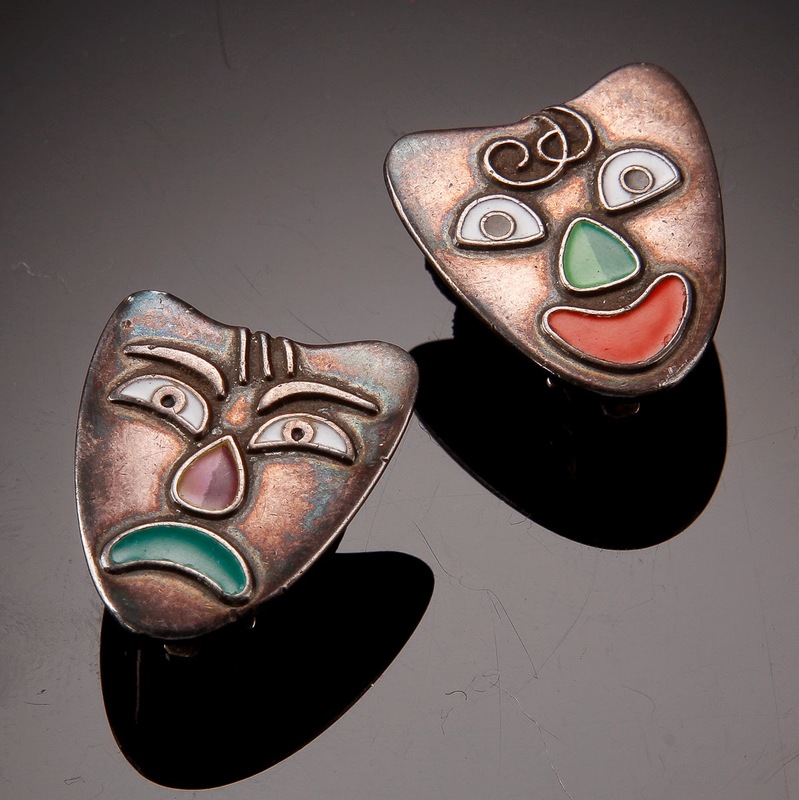 A pair of heavy patinated earrings by Erik Magnussen.